Each Dax fiberglass hat comes with a 6 point ratchet suspension and should fit head sizes 7.0 to 8.0. The suspension comes with a soft padded top to offer additional cushioning for the head. This is truly an impressive hard hat. 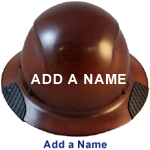 Click the button below to add the DAX Fiberglass Composite Hard Hat - Cap Style Natural Tan to your wish list.